Breitling and aviation go hand-in-hand, to the point where the watchmaker operates a flying team. That’s dedication – dedication that began with one watch: the Navitimer. First built in 1952, it’s aviation-oriented slide rule made it an instant mainstay of any professional cockpit. It was a golden era, not just for Breitling but for flight. Now, the watchmaker is looking fondly back on that era with their first ever re-issue: the Breitling Navitimer Ref. 806 1959. The 806 is to this day one of the most sought-after of all vintage Navitimers (it took Breitling a handful of years to really nail the design) and this re-issue is one for the purists. It’s about as authentic as you can get without buying up a shipment of new-old parts. That authenticity is borderline obsessive. 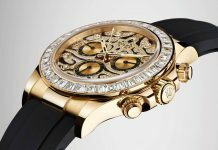 The beaded bezel, which varied from reference to reference, has precisely the same number of notches as the original, 60-year-old piece. That’s 94 in case you didn’t fancy counting. That bezel even has a slide rule in exact imitation of that first generation of watches. As is invariable the case with re-issues Breitling have used a vintage logo and have made sure it’s the European one rather than the signed US version. It’s not just vintage fans that’ll get a kick out of it though; it’s a timeless design, one that could have been built yesterday rather than yesteryear. Plus, it has all the mod cons that Breitling have introduced over the decades, including their COSC-certified, hand-wound B09 movement, a calibre that we’ll be seeing a lot more of, I’m sure. The re-issue also has greater water resistance and new Superluminova – albeit adapted to look a little more vintage than the usual eerie green. At 40.9 the new old Navitimer certainly has classical sizing down, at least compared to some of the more modern, much heftier versions. With its black, tone-on-tone dial it’s as elegant a Navitimer as we’ve ever seen. In short, the Premier collection may have been a huge leap forwards for Breitling, but it’s damn good to see them paying homage to the watch that made them… well, Breitling. For more information visit Breilting’s website. 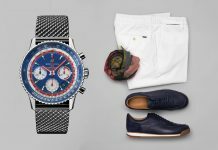 Share the post "Introducing the Breitling Navitimer Ref. 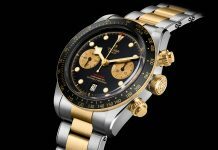 806 1959 Re-Edition"